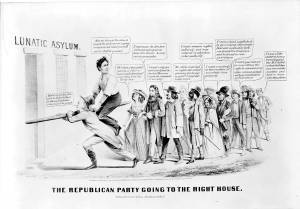 "The Republican Party Going to the Right House"
Abraham Lincoln's supporters are portrayed as radicals and eccentrics of various stripes. The satire is loosely based on an anti-Fremont cartoon from the previous presidential race, "The Great Republican Reform Party" (no. 1856-22), also issued by Nathaniel Currier.